Sarva Haryana Gramin Bank has announced opening for the post of Officer Junior Management Scale-I and Office Assistant (Multipurpose). 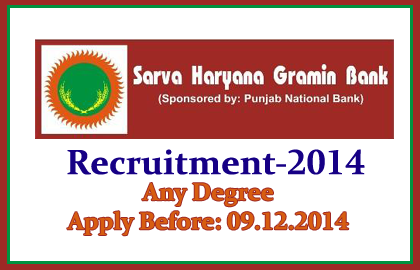 Eligible candidates can apply for this post on or before 09.12.2014. More details regarding this recruitment were mentioned below. Selection Process: Candidates will be selected on the basis of the performance in the RRBs CWE-III conducted by IBPS in September 2014, and in Personal Interview. Candidates should pay the below mentioned amount as application fee for the both post.